Justin Chapple’s Chocolate-Peanut Pie & More Recipes from Just Cook It! One of the best cookbooks Faith’s cooked from this year, Just Cook It! 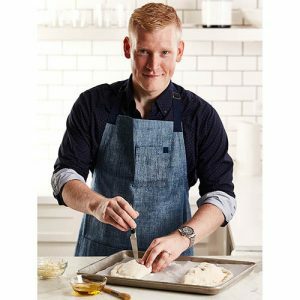 by Food & Wine’s Justin Chapple is a home cook’s dream. Justin shares his recipes for Roasted Carrot & Avocado Panzanella, Classic Meatloaf Sandwiches with Tomato Jam, and Chocolate-Peanut Pie. Oh, boy. Plus, wine discoveries from Napa Valley and Spain. Faith’s favorite, Museum Reserva, has a new vintage available! Both wines are great with grilled foods and available in our region. Haven’t had your “Faith Doughnut” from Nature’s Grocer yet? Hear the Food Schmooze® team rave when Kelly Boudreaux stopped by our studio with a box.